INSTRUCTIONS ON HOW TO MAKE YOUR OWN PIPE/HANG MOUNT WITH MATERIALS FOUND AT YOUR LOCAL LUMBER/HARDWARE STORE. Pictures below show how you can mount your Super Feeder® to a vertical fencing pipe next to your pond. You can have a diagonal main pipe that slips into an angled larger pipe in the ground for easy removal, or you can use a 4-6 foot or so vertical pipe (1 3/8") placed in concrete in a post digger hole next to your pond. 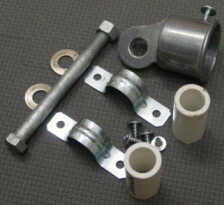 Using the second technique, you can use the elbow below to swivel a lateral pipe over your pond for servicing your feeder. You can tighten the elbow to hold it in place, and loosen the screws to move it as desired. 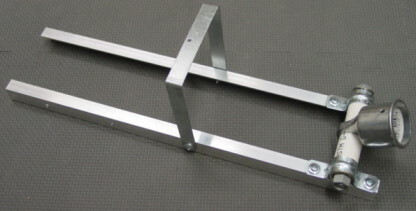 The vertical post should be a metal pipe for rigidity. 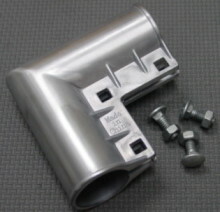 The lateral pipe could be 1" PVC. 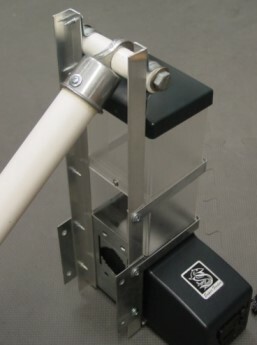 The pipes may be a bit undersize, so you may need to wrap some duck tape at both ends of the lateral arm to build up the diameter for a snug fit in the pivoting cap of the feeder mount and the elbow. At left, 14 1/2" x 1 1/2" x 3/4" aluminum angle supports (if used with any of the large hoppers or extra clear extensions, they will need to be longer), and eleven #8 x 1/2" sheet metal screws including the ones in the pivot assembly. 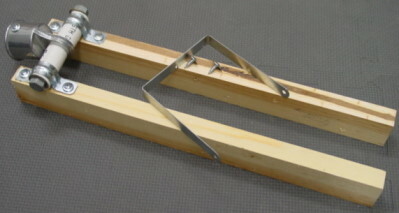 You should also use an extra hopper extension strap which is available from us or you could make yourself. All these materials are available at Home Depot® or Lowe's. 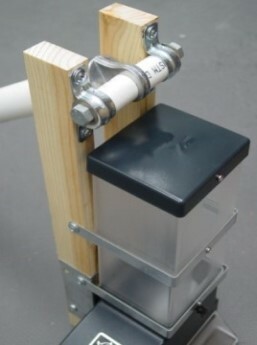 You can of course mount the feeder to any vertical 2x4, 4x4 or pipe with its normally supplied hardware, without any of the these items being required. 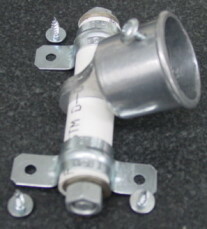 The pivot assembly consists of a fence cap (you will need to drill a hole in it for a screw to keep it in place), two 1/2" x 1 5/8" PVC pipe sleeves, two double-hole electrical conduit 1/2" metal straps, one 4" x 3/8" galvanized bolt and nut with two washers, and 5ea. #8 and 1/2" sheet metal screws counting the one added in the pivot cap. Once again, you should drill a 5/32" hole through the cap for a screw to hold it in place on the lateral pipe. 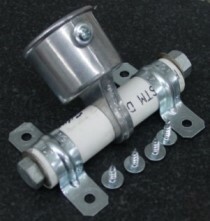 We may have the elbow and end pivot cap available on our store but not other parts shown.